First, Smart introduces the Smartalk Unli Call and Text with PhP100 (for 4 days) and PhP25 (for 1 day) denominations to their prepaid subscribers – Smart Buddy. 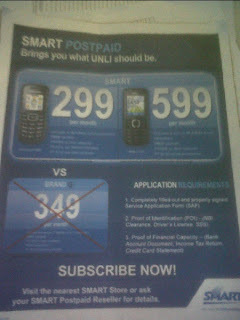 Now, they’re bringing the service to their postpaid users – the Smart Unli Postpaid. Smart Unli Postpaid, as the name suggests, offers unlimited call and/or text service to Smart, Talk N Text, Infinity and Red Mobile users. It has two denominations: Plan 299 which is for unlimited text and Plan 599 for unlimited call and text. The Smart Unli Postpaid plans also comes with a new phone. Plan 299 is bundled with Samsung E1080 while Plan 599 is with Nokia C101. Both plans are locked-in a 24-month period just like a regular Smart Gold plan. I was at the Smart Wireless Center SM MegaMall when I saw posters of this newest service from Smart. I was told that it was just released today so they only have a few fliers. I wasn’t able to get one so I took a photo of it for this blog. I’m a Smart Gold subscriber and I’ve always wanted to enjoy mobile freedom but the current service is just too limited. You’re locked in to 24-months and any Gold-applicable promos are always billed on top of your plan. So hearing this kind of promo interests me. I’m hoping that they could offer more in the coming months knowing that their direct competitor, Globe, is offering a plan that you can customized every month. By the way, I called their customer service hotline to ask more information about this plan and was told that Smart Unli Postpaid is just a promotional service that will run from July 7 to October 7, 2011 only. But I’m pretty sure they’ll extend this and will make this a regular offering if they can get more subscriptions just like what happened to Smart Gold Lite. What do you think of this offer? Is it worth applying for? And if you’re in Globe or Sun postpaid, are you switching for this? Got my MicroWorkers PIN and Payment via PayPal!